Bryan R. Fischer has written and published books that are used in our courses, including GD&T Books, GD&T Manuals, Tolerance Analysis Books, Tolerance Stackup Books, Tolerance Analysis Manuals, Tolerance Stackup Manuals, Tolerance Analysis Workbooks, Tolerance Stackup Workbooks, and material that covers 3D Model-Based Product Definition (MBD) and 3D Model-Based Enterprise (MBE). Most of our books and materials are published by Advanced Dimensional Management Press. The Journeyman’s Guide to GD&T is the essential reference for engineering, design, drafting, quality, inspection, manufacturing, procurement, assembly and service personnel and students. The material is developed carefully in a technically and mathematically precise manner, but presented in a way that makes this often tricky subject easy-to-understand. The Journeyman’s Guide to GD&T is written from the point-of-view of the design engineer who must understand and apply GD&T specifications, but it is equally suited to other disciplines who must understand GD&T. Now in its second printing. 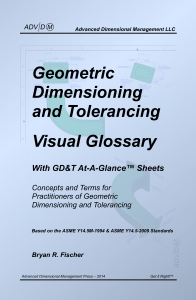 The GD&T Update Guide: ASME Y14.5-2009 is the first entry in our new series of GD&T reference materials, and it discusses the principal changes and improvements in the ASME Y14.5-2009 standard. Changes in the structure, philosophy, expansion of scope, and the overall intent of the new revision are discussed. New terms, definitions, symbols, rules, feature types, tools, techniques, approaches, and changes made to each section of the standard are also discussed. 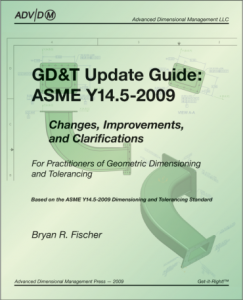 The GD&T Update Guide: ASME Y14.5-2009 also includes a detailed paragraph-by-paragraph explanation of the principal changes in ASME Y14.5-2009. 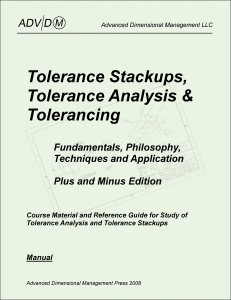 Tolerance Stackup, Tolerance Analysis and Tolerancing Manual: Plus and Minus Edition is for people who do not use GD&T. Yes, you should use GD&T, especially if you want to clearly explain allowable part variation and clearly understand what the drawing specifications mean. 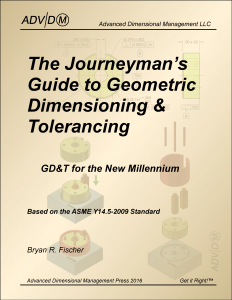 Unfortunately not everyone out there has made the move to GD&T, so we created Tolerance Stackup, Tolerance Analysis and Tolerancing Manual: Plus and Minus Edition as a tool to help those still in the world of plus and minus dimensioning and tolerancing.